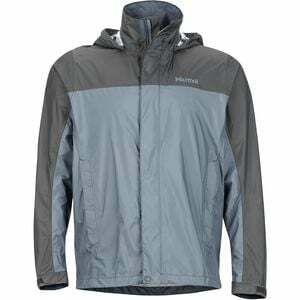 While some may see "chance of rain" as a sign to cancel the day's hike, the Marmot Men's PreCip Jacket sees it as an invitation. It offers waterproof, breathable performance and a packable design to make it ideal for everything from treks in unpredictable weather to errands around town on a rainy day. The NanoPro fabric provides complete protection from the elements while still allowing heat and moisture vapor to escape, keeping you from getting soaked with sweat when you're slogging your way up a hill. If you're still feeling too warm, you can open up the zippered underarm vents for instant cooling relief. You've got Marmot's signature Angel-Wing Movement design for uninhibited movement that won't cause your jacket to ride up, and accessible Pack Pockets that are placed higher to accommodate a backpack or harness.